DP World, the container port business owned by troubled investment group Dubai World, is to seek a share listing on the London Stock Exchange. The planned listing would be the second for DP World, which has been a member of the Dubai Stock Exchange since 2007. The firm, which owns 49 ports around the world, has been disappointed with its valuation on that exchange. State-owned Dubai World made headlines in November when it sought to delay repayments on its $26bn (£16bn) debt. 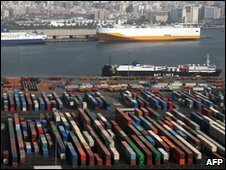 "Previously DP World's management had said it was not happy with the valuation the market was putting on the company and was looking at ways to unlock value for shareholders," said Rami Sidani, head of investment at Schroders Middle East. "One of the concerns would have been the lack of liquidity on the Nasdaq Dubai, so a dual listing is a good idea. The company will be more visible to international investors," he said. DP World said it aimed to float in London in the second quarter of 2010. What spoiled the party in Dubai?